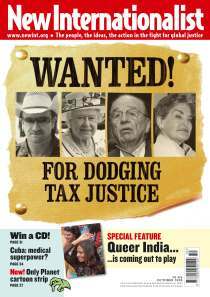 As globalization goes mental and public funds prop up the world’s banks, this month New Internationalist uncovers the global tax scandal - and suggests where justice might lie. A US defence contractor is claiming to have developed a technology that allows sounds to be beamed directly into people's heads. A heartrending love-story and a searing indictment of authoritarianism in all its forms.